A discussion on the different types of UPS, their characteristics, advantages and disadvantages. A variety of design approaches are used to implement UPS systems, each with distinct performance characteristics. The most common design approaches are standby; line interactive; standby-ferro; double conversion on-line, and delta conversion on-line. This is the most common type used for desktop computers. In the block diagram in Fig. 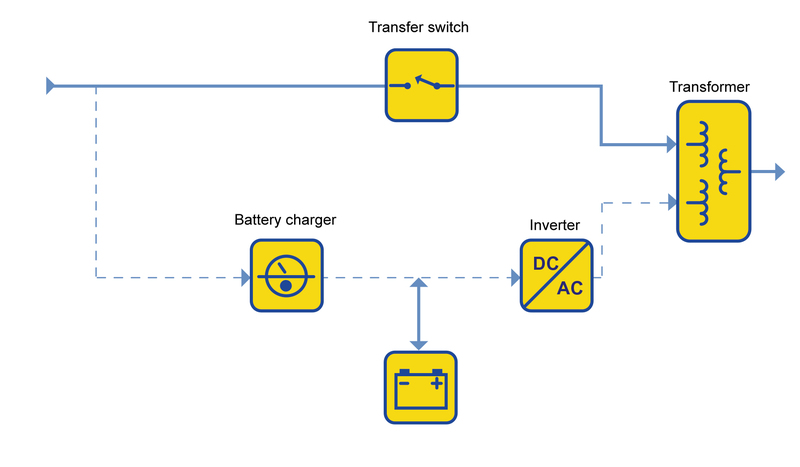 1, the transfer switch is set to choose the filtered AC input as the primary power source (solid line path), and switches to the battery or inverter as the backup source, should the primary source fail. When that happens, the transfer switch must operate to switch the load over to the battery or inverter backup power source (dashed path). The inverter only starts when the power fails. High efficiency, small size and low cost are the main benefits of this design. These systems can also provide adequate noise filtration and surge suppression with proper filter and surge circuitry. The line interactive UPS, shown in Fig. 2, is the most common design used for small business and web and departmental servers. In this design, the battery-to-AC power converter (inverter) is always connected to the output of the UPS. Operating the inverter in reverse during times when the input AC power is normal provides battery charging. Fig. 2: Line interactive UPS. When the input power fails, the transfer switch opens and the power flows from the battery to the UPS output. 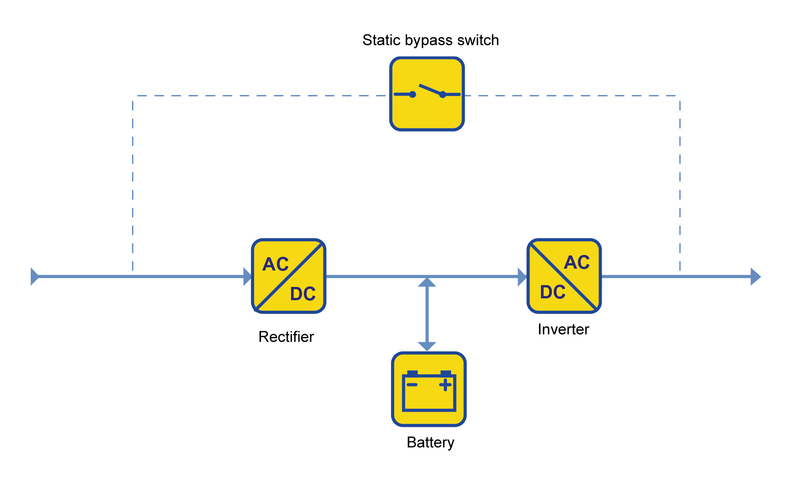 With the inverter always on and connected to the output, this design provides additional filtering and yields reduced switching transients when compared to the standby UPS topology. The line interactive design usually incorporates a tap-changing transformer. This adds voltage regulation by adjusting transformer taps as the input voltage varies. Voltage regulation is an important feature when low-voltage conditions exist, otherwise the UPS would transfer to battery and then eventually down the load. This more frequent battery usage can cause premature battery failure. However, the inverter can also be designed so that its failure will still permit power flow from the AC input to the output, which eliminates the potential of single point failure and provides for two independent power paths. High efficiency, small size, low cost and high reliability, coupled with the ability to correct low or high line voltage conditions, make this the dominant type of UPS in the 0,5 – 5 kVA power range. This was once the dominant form of UPS in the 3 – 15 kVA range. This design depends on a special saturating transformer that has three windings (power connections). The primary power path is from AC input, through a transfer switch and the transformer, and to the output. In the case of a power failure, the transfer switch is opened and the inverter picks up the output load. In the standby-ferro design, the inverter is in the standby mode, and is energised when the input power fails and the transfer switch is opened. The transformer has a special “ferroresonant” ability which provides limited voltage regulation and output waveform “shaping”. The isolation from AC power transients provided by the ferro transformer is as good as or better than any filter available. But the ferro transformer itself creates severe output voltage distortion and transients, which can be worse than a poor AC connection. Even though it is a standby UPS by design, the standby-ferro generates a great deal of heat because the ferro-resonant transformer is inherently inefficient. These transformers are also large relative to regular isolation transformers, so standby-ferro UPSs are generally quite large and heavy. Fig. 4: Double conversion on-line UPS. Standby-ferro UPS systems are frequently represented as on-line units although they have a transfer switch. The inverter operates in standby mode, and exhibits a transfer characteristic during an AC power failure (see Fig. 3). Reliability and excellent line filtering are this design’s strengths. However, the design has very low efficiency combined with instability when used with some generators and newer power-factor corrected computers. The principal reason why standby-ferro UPS systems are no longer used commonly is that they can be fundamentally unstable when operating computer power supply loads. All large servers and routers use power factor corrected power supplies, which draw only sinusoidal current from the utility, much like an incandescent light bulb. This smooth current draw is achieved using capacitors. Ferro resonant UPS systems use heavy core transformers which have an inductive characteristic, meaning that the current “lags” the voltage. The combination forms a “tank” circuit. Resonance or “ringing” in a tank circuit can cause high currents which jeopardise the connected load. This is the most common type of UPS above 10 kVA. The block diagram of the double conversion on-line UPS (see Fig. 4) is the same as the standby, except that the primary power path is the inverter instead of the AC main. In the double conversion on-line design, failure of the input AC does not cause activation of the transfer switch because the input AC is charging the backup battery source providing power to the output inverter. Therefore, on-line operation results in no transfer time during an input AC power failure. Both the battery charger and the inverter convert the entire load power flow. Fig. 5: Delta conversion on-line UPS. This UPS provides nearly ideal electrical output performance but the constant wear on the power components reduces reliability over other designs. Also, the input power drawn by the large battery charger may be non-linear, which can interfere with building power wiring or cause problems with standby generators. This design is a newer technology introduced to eliminate the drawbacks of the double conversion on-line design and is available in sizes ranging from 5 kVA to 1,6 MW (see Fig. 5). Similar to the double conversion on-line design, the delta conversion on-line UPS always has the inverter supplying the load voltage. 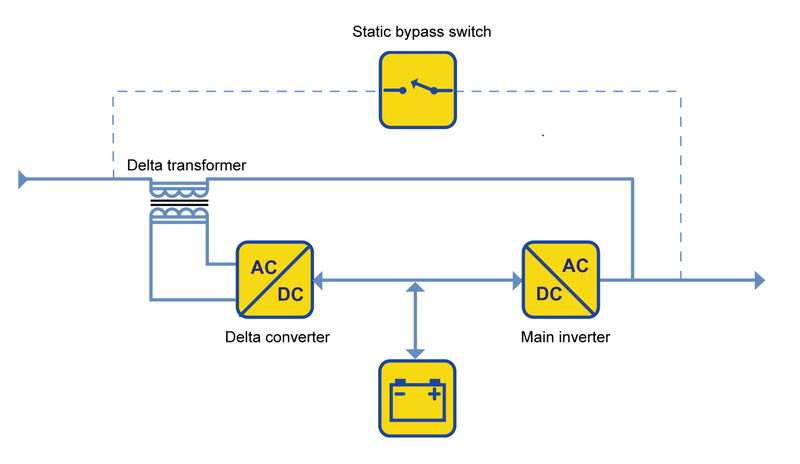 However, the additional delta converter also contributes power to the inverter output. This design exhibits behaviour identical to the double conversion on-line under conditions of AC failure or disturbances. A simple way to understand the energy efficiency of the delta conversion topology is to consider the energy required to deliver a package from the fourth to the fifth floor of a building (see Fig. 6). This technology saves energy by carrying the package only the difference (delta) between the starting and ending points. The double conversion on-line UPS converts the power to the battery and back again, whereas the delta converter moves components of the power from input to the output. Fig. 6: Analogy of double conversion versus delta conversion. In this design, the delta converter acts with two purposes. The first is to control the input power characteristics. This active front end draws power in a sinusoidal manner, minimising harmonics reflected onto the utility, ensuring optimal utility and generator system compatibility, and reducing heating and system wear in the power distribution system. The second function is to control input current to regulate charging of the battery system. This UPS provides the same output characteristics as the double conversion on-line design but the input characteristics are often different. Delta conversion on-line designs provide dynamically-controlled, power factor-corrected input, without the inefficient use of filter banks associated with traditional solutions. The most important benefit is a significant reduction in energy loss. The input power control also makes the UPS compatible with all generator sets and reduces the need for wiring and generator oversizing. 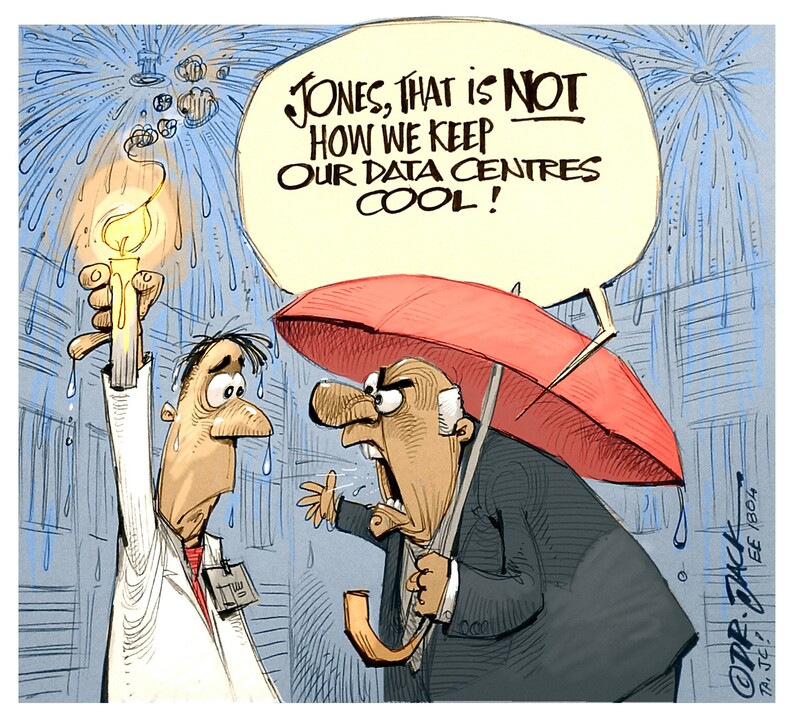 Delta conversion on-line technology is the only core UPS technology today protected by patents and is therefore not likely to be available from a broad range of UPS suppliers. Under steady state conditions, the delta converter allows the UPS to deliver power to the load with much greater efficiency than the double conversion design.